1423(9) EURO BUS / RULE TURS, Macedonia. 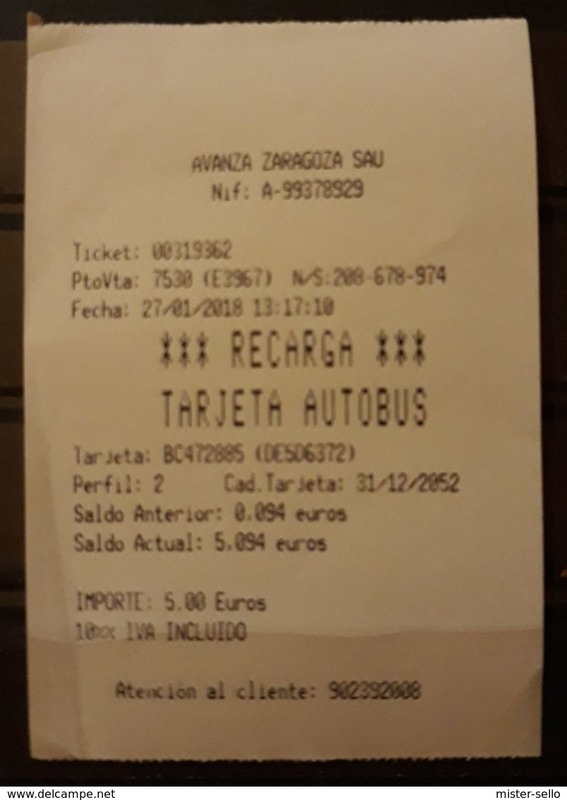 Bus ticket Skopje (Macedonia) to Kashar & Tirana (Albania), 2017. RENFE ESPAÑA. 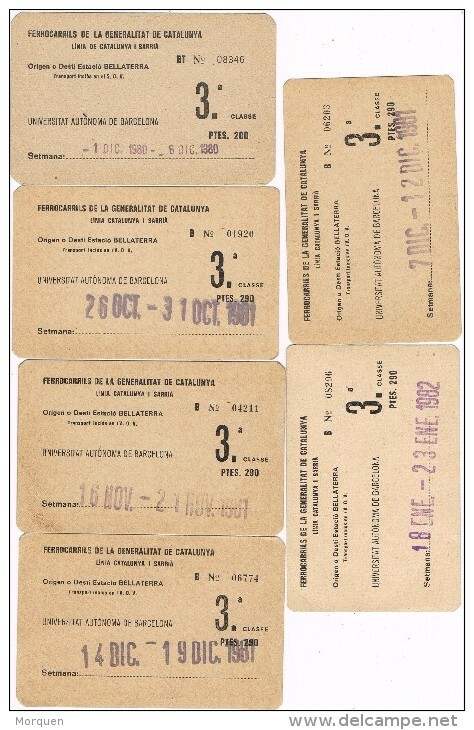 5 TICKET DIFERENTES. 1423(8) WIEN / VIENNA / VIENNE / VIENA. 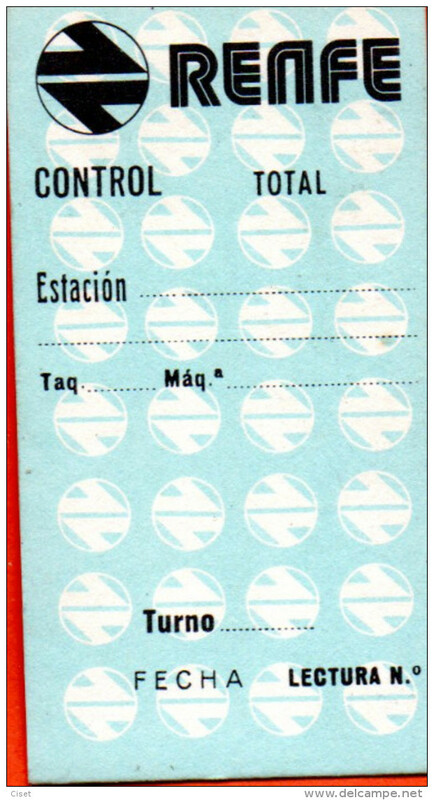 Urban transport ticket (1976). 1423(7) CALIFORNIA, USA. 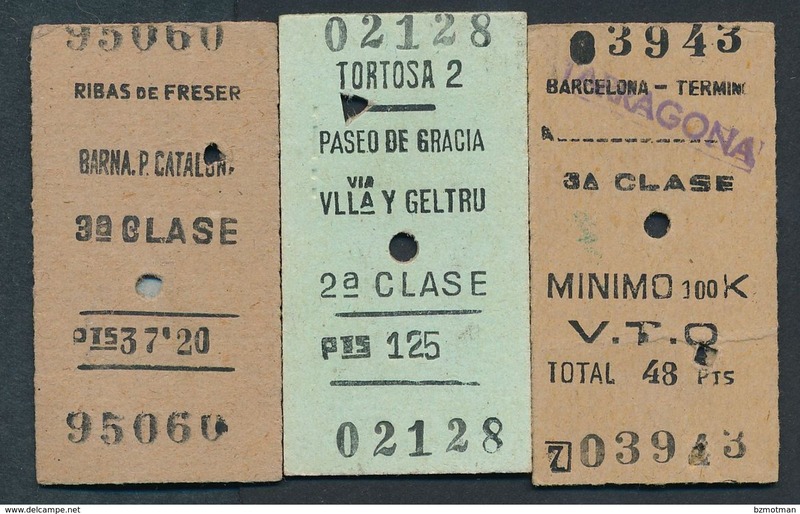 Railway tickets. 1423(4) ESPAÑA / SPAIN / ESPAGNE / SPAGNA. 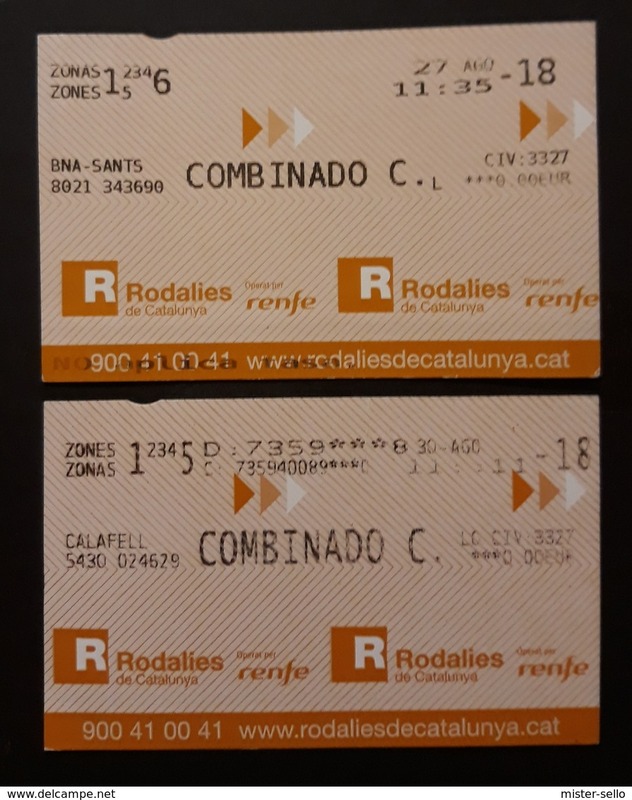 Bus tickets of Catalunya / Catalonia / Catalogne & Menorca / Minorque. 1423(3) MINSK Belarus / Biélorussie / Bielorrusia / Bielorussia. 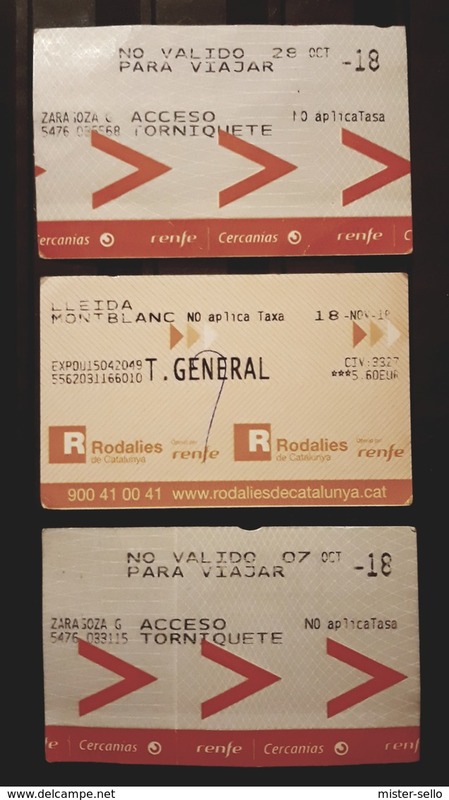 3 urban transport tickets (bus, trolleybus, tram). 1423(2) BARCELONA, Spain. 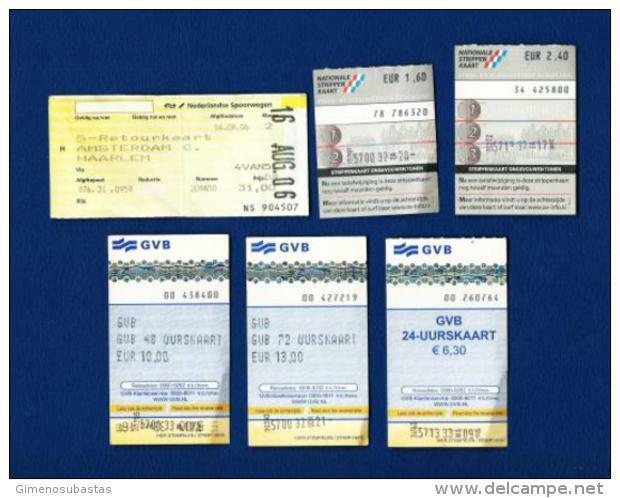 4 old tickets tram & subway / anciens billets tram et metro / vecchi biglietti tram e metro. 1372 VIBASA (Spain / Espagne). 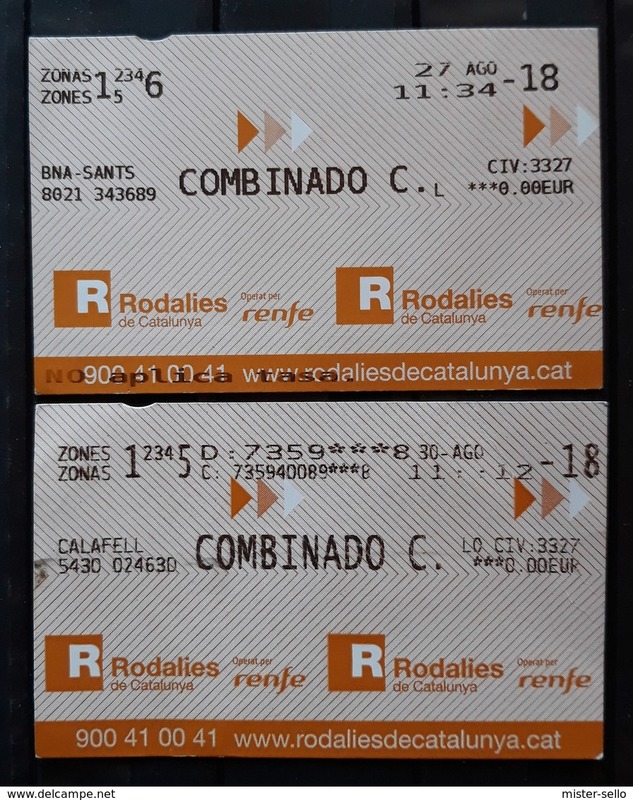 Bus ticket Barcelona-Pamplona (2012) - 8,5 x 5,5 cm. 1354(8) ESPAÑA / SPAIN / ESPAGNE / SPAGNA / SPANIEN. 6 transport tickets. 6 billets de transport. 6 biglietti trasporto. 1354(7) CHILE / CHILI / CILE. 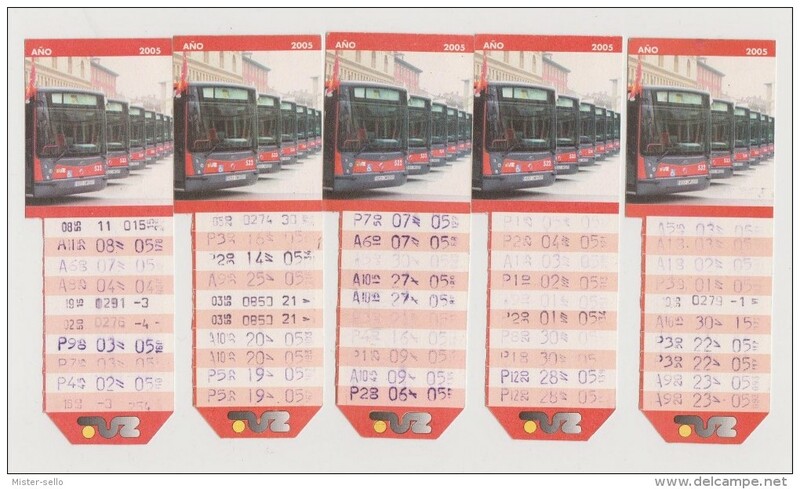 Bus tickets. 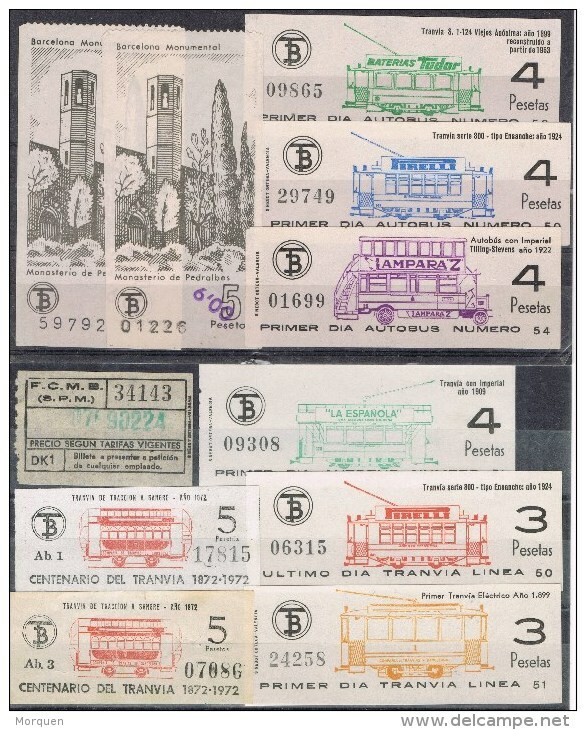 Billetes de autobús. 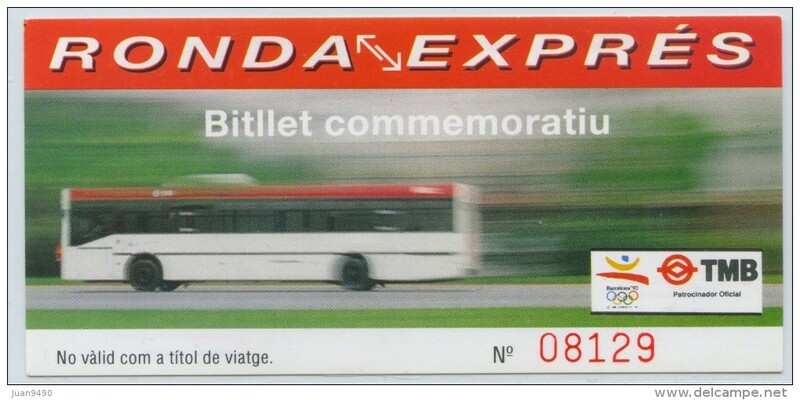 Billets de bus. Biglietti di autobus. 1354(4) ESTONIA. 2 bus tickets: Tallinn, Kohtla-Järve to Jõhvi. 1354(3) THAILAMND. 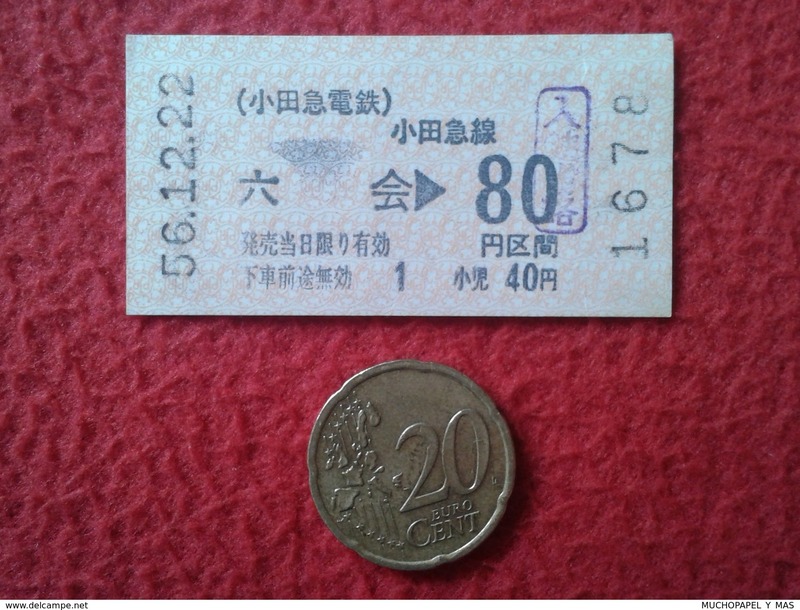 Railway ticket (1997 -> 2540 of Thai calendar). 1354(2) SCHWITZERLAND / SCHWEIZ / SUISSE. 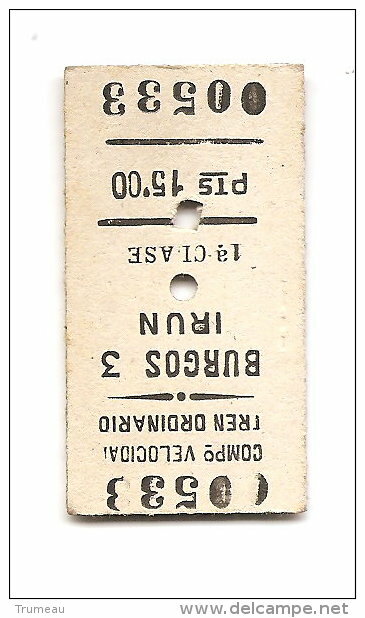 Railway ticket Zürich HB - Luzern (13.03.1956). 1354(1) TELEFÉRICO DE MONTAÑA / TÉLÉPHÉRIQUE DE MONTAGNE / MOUNTAIN CABLEWAY. Italia/Italy, Poland. 1353(4) POLAND / POLOGNE / POLONIA / POLEN. 4 urban transport tickets / billets de transport urbain: Rzeszów, Warsaw. 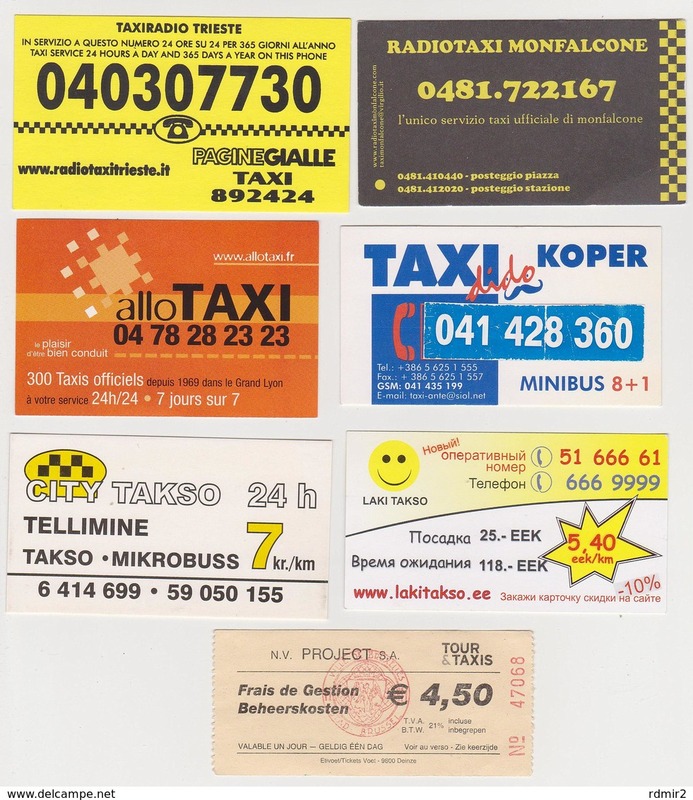 1352(2) TAXI, 7 cards / cartes / tarjetas / carte: Italy (2), France (1), Slovenia (1), Estonia (2), Belgium (1). 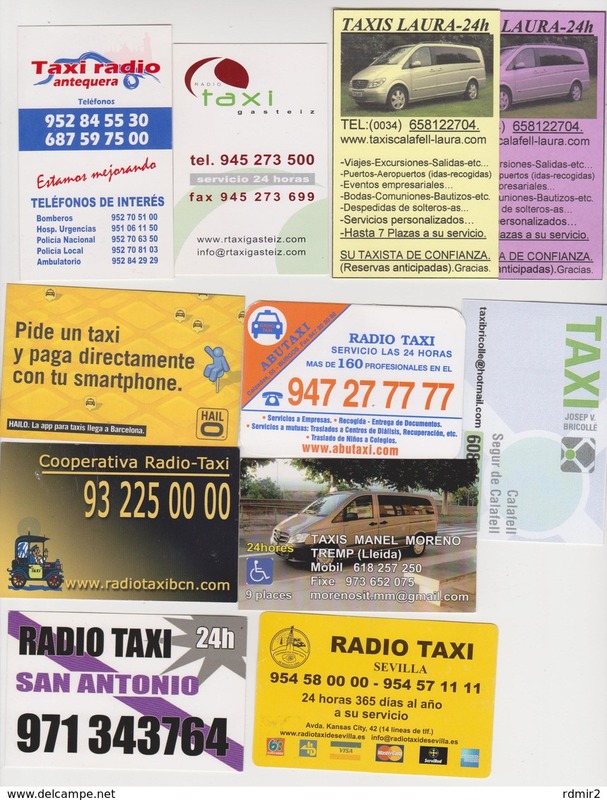 1352(1) TAXI, 10 cards / cartes / tarjetas / carte.- Spain / Espagne / España / Spagna. 1350(11) COMPAGNIE DE TRANSPORTS DU MAROC (Morocco, Marruecos. Marocco. Marokko). 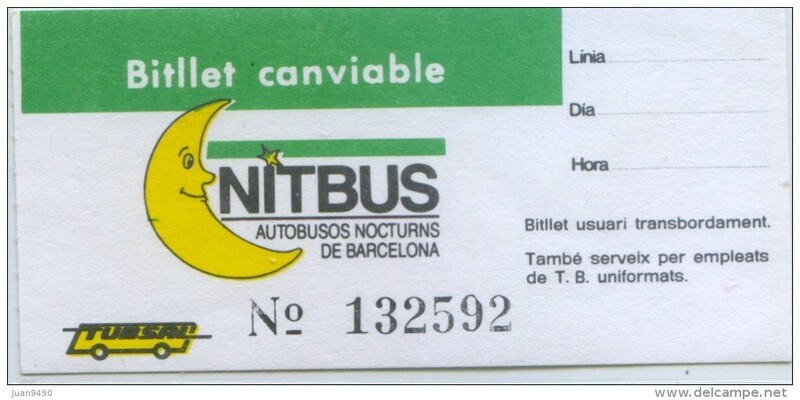 Bus ticket to Agadir. 1350(10) SAN SEBASTIÁN / DONOSTIA. Spain. España. Espagne. 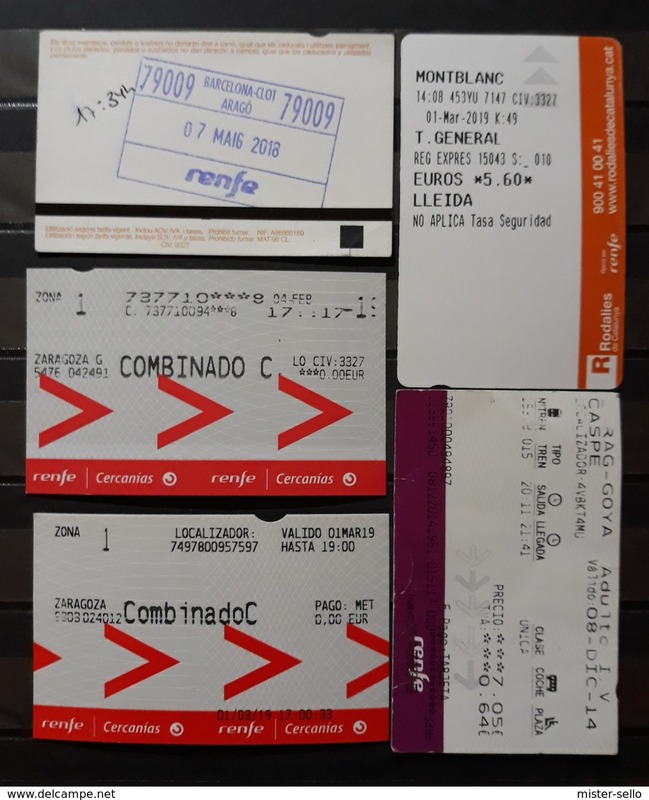 Spagna..- Tickets EuskoTran (tram, tramway), 2012..
1350(8) PORTUGAL / PORTOGALLO..- 2 transport tickets of Porto / Oporto. 1350(6) MEXICO. Mexique. Messico. 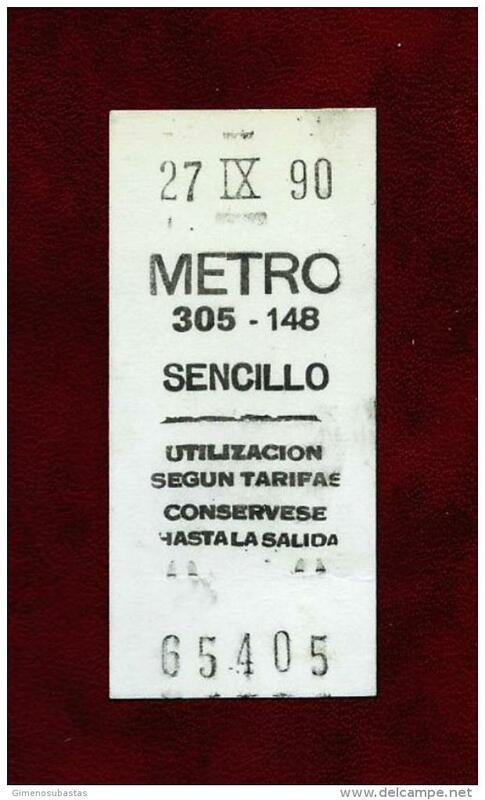 Mexiko.- 2 bus tickets: Cuernavaca-Taxco, Taxco-Cuernavaca (2010)..
1350(3) HRODNA / GRODNO, Belarus. Biélorussie. Bielorrusia. Bielorussia. 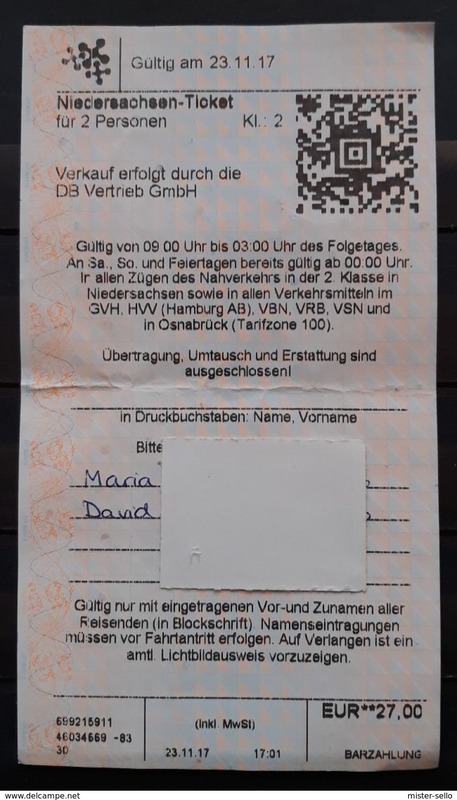 Bus ticket (2010). 1350(2) TARTU, Estonia / Estonie / Estland. 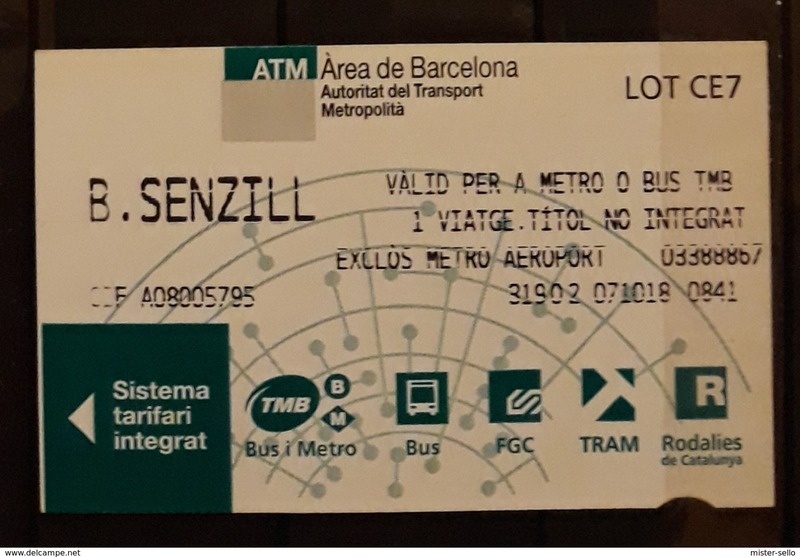 Bus ticket (2009). 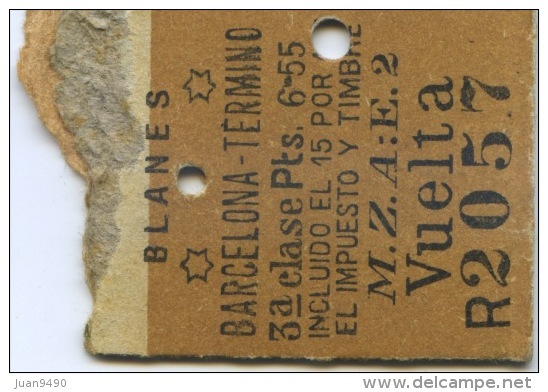 1350(1) TRANVIAS DE BARCELONA. 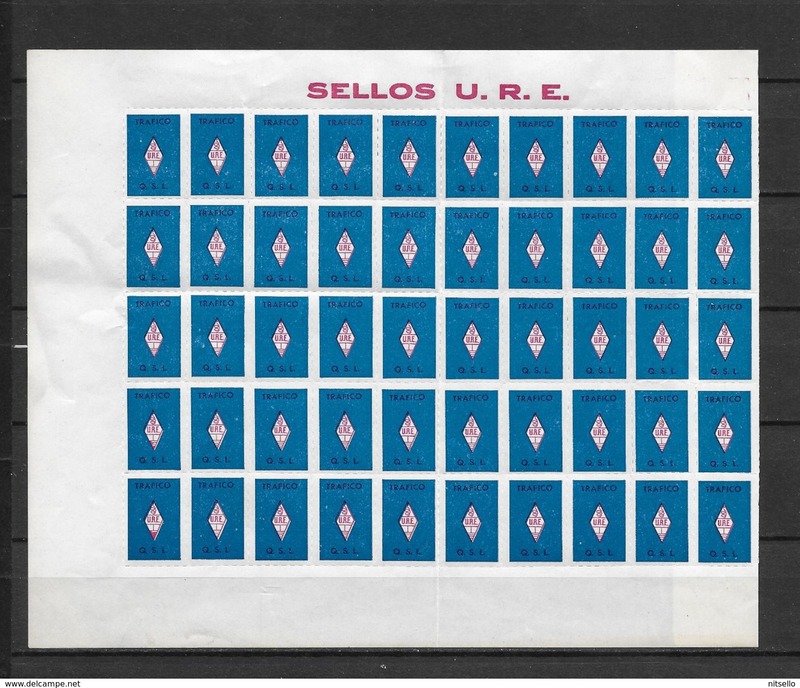 Billete antiguo. 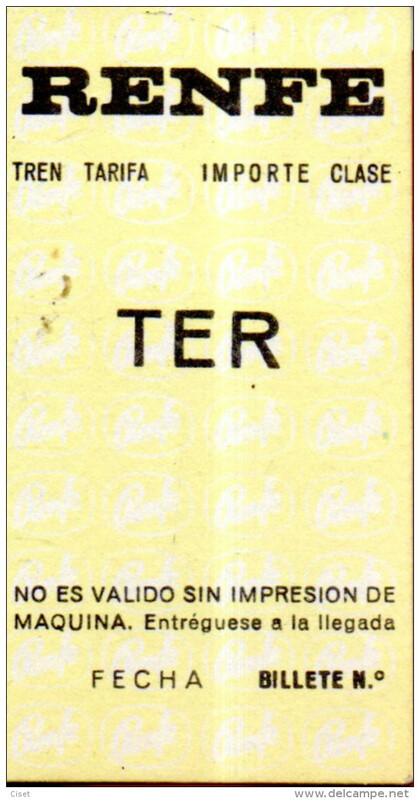 Old ticket. Billet ancien. 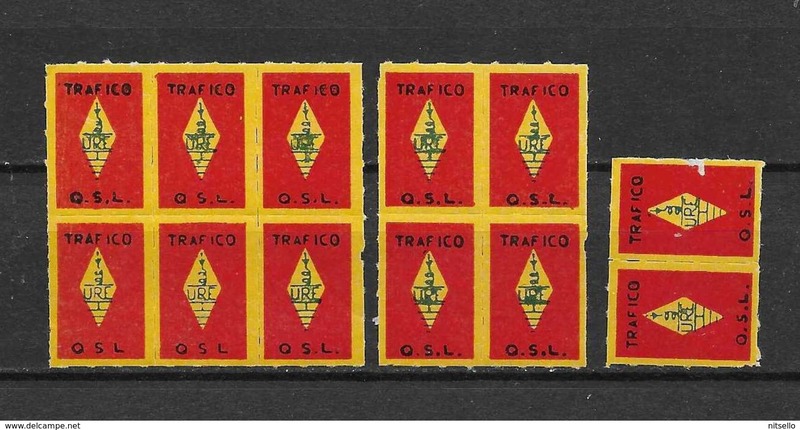 Biglietto antico (1920s). 602f/ GRIMALDI LINES. 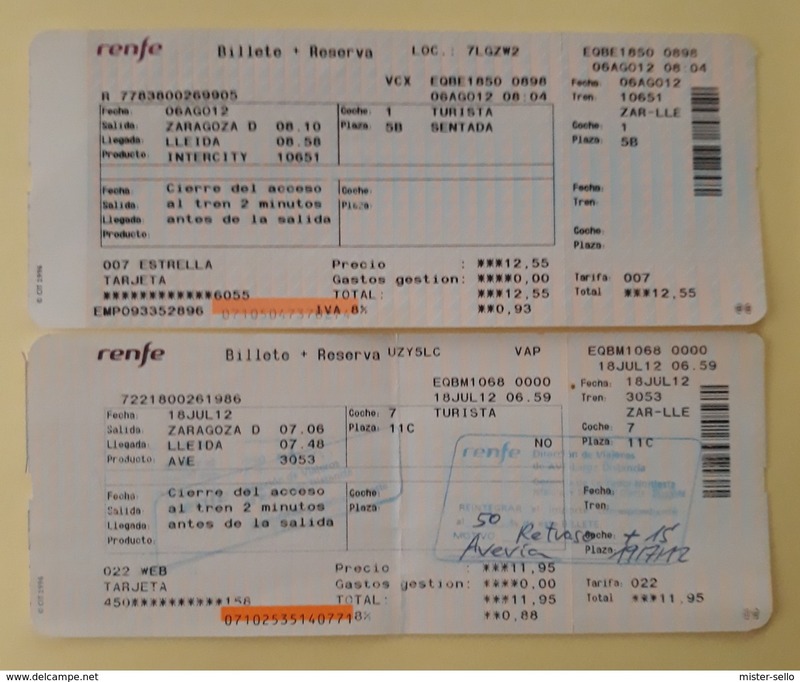 Ticket ferry Barcelona (Spain) - Porto Torres (Sardinia, Italy), 07.2016..
602e/ CLERMONT-FERRAND, France. 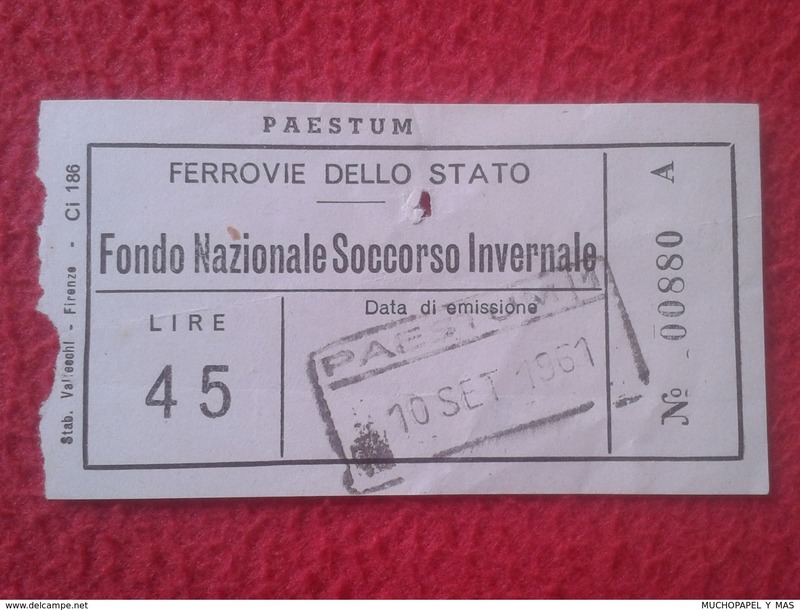 Used bus ticket / Billet de bus utilisée / Biglietto di autobus usato. 602c/ RENFE (Spain / Espagne). 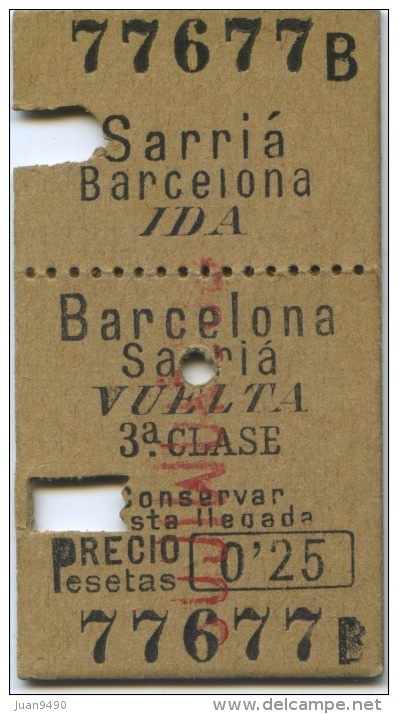 Ticket / billet / biglietto BARCELONA-PUIGCERDÀ (Catalonia). 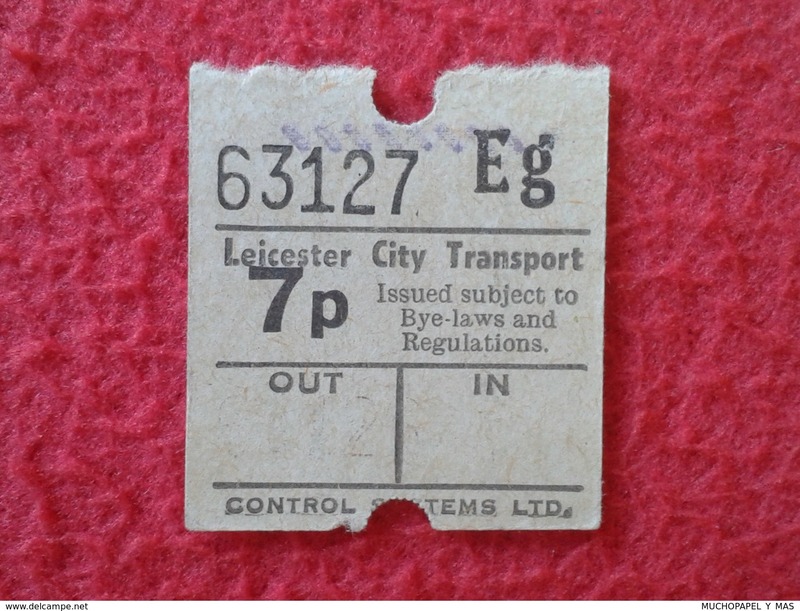 TICKET DE ENTRADA BILLETE ENTRY ENTRANCE ENTRÉE TRANSPORTE LEICESTER CITY TRANSPORT ENGLAND UNITED KINGDOM VER FOTOS. RENFE ESPAÑA. 3 TICKET AVE + REGIONAL. 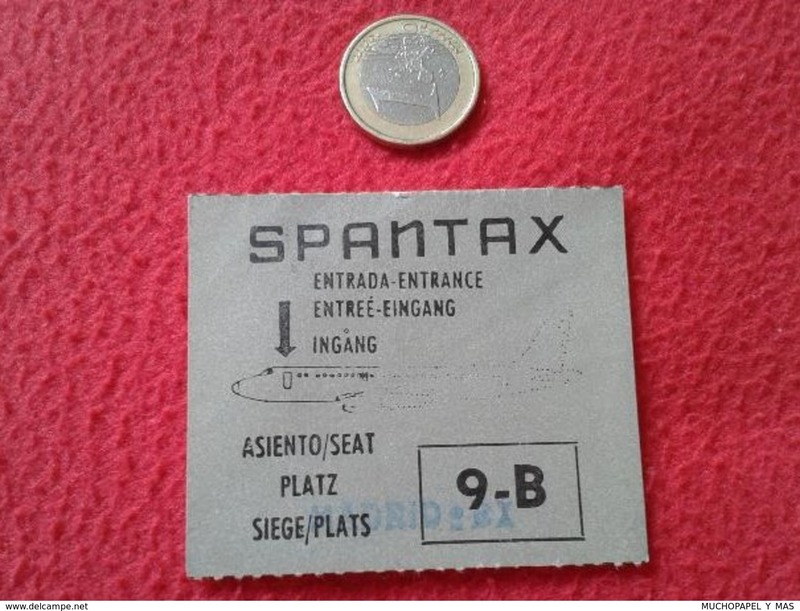 TICKET DE ENTRADA BILLETE ENTRY ENTRANCE ENTRÉE TRANSPORTE ? BUS ? TRAIN? JAPAN NIPPON ? JAPÓN ? CHINA ? CHINE ? KOREA ? 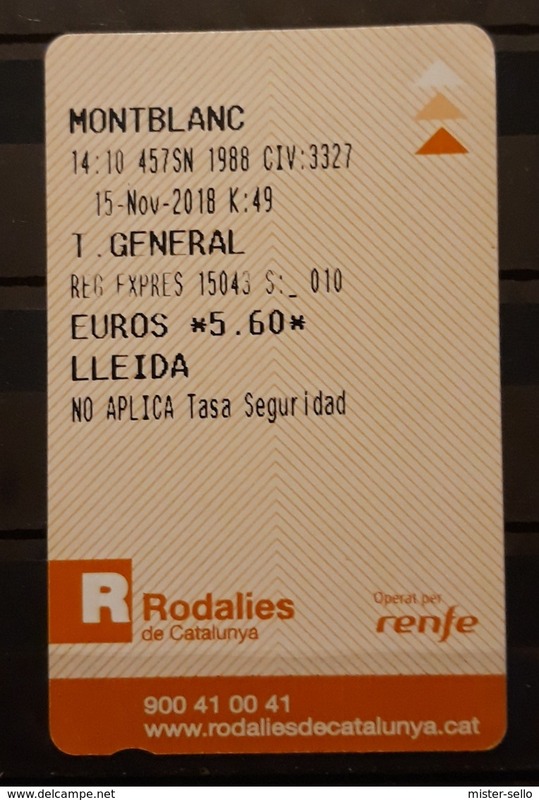 2018 RENFE ESPAÑA. 3 TICKETS. 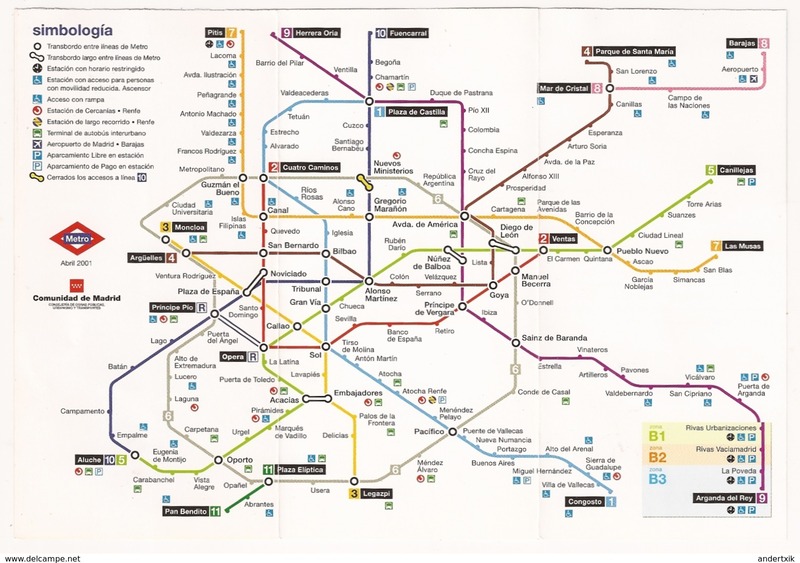 2012 RENFE ESPAÑA. 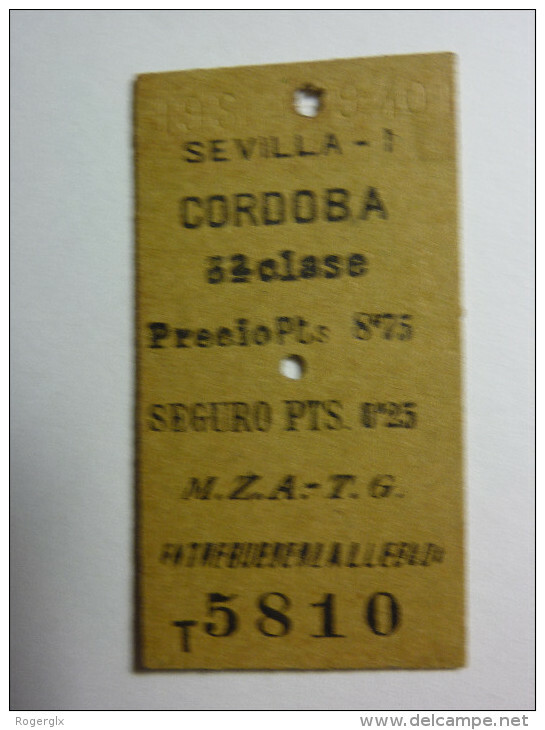 TICKET INTERCITY ZARAGOZA - LLEIDA. 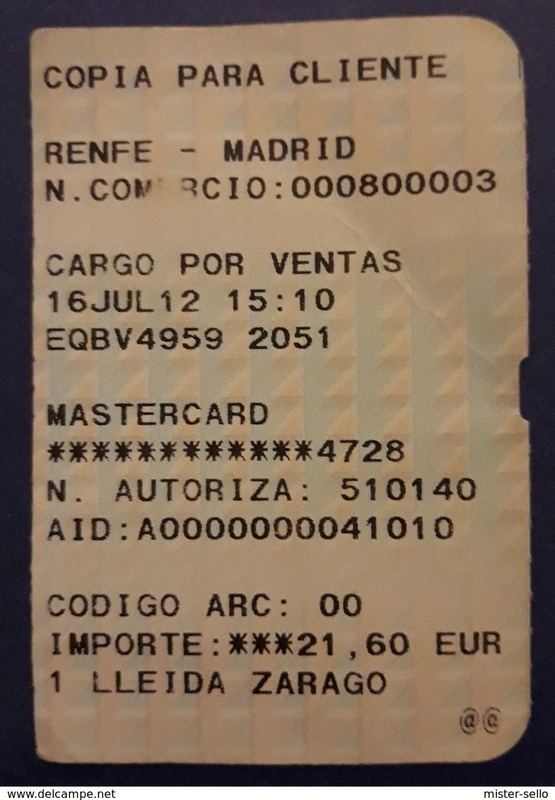 2012 RENFE ESPAÑA. 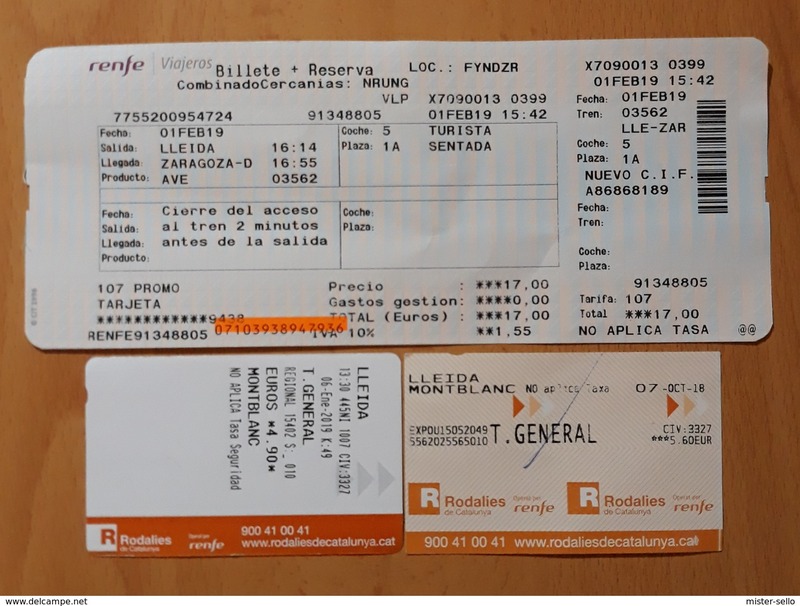 2 TICKET INTERCITY + AVE.
2018 RENFE ESPAÑA. 2 TICKETS. 2018 BARCELONA. 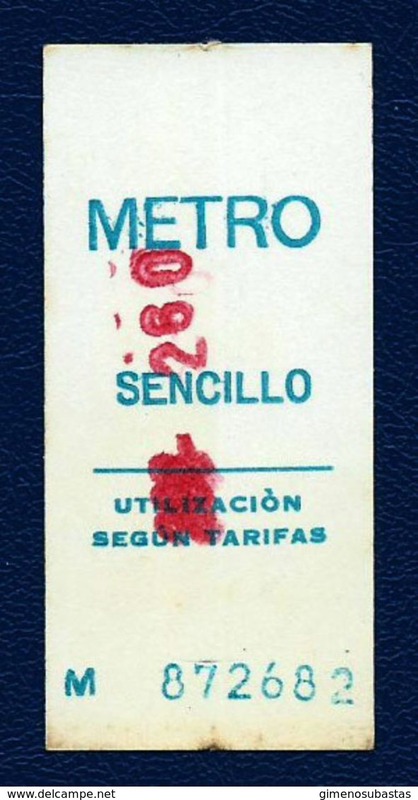 TICKET TREN Y METRO. 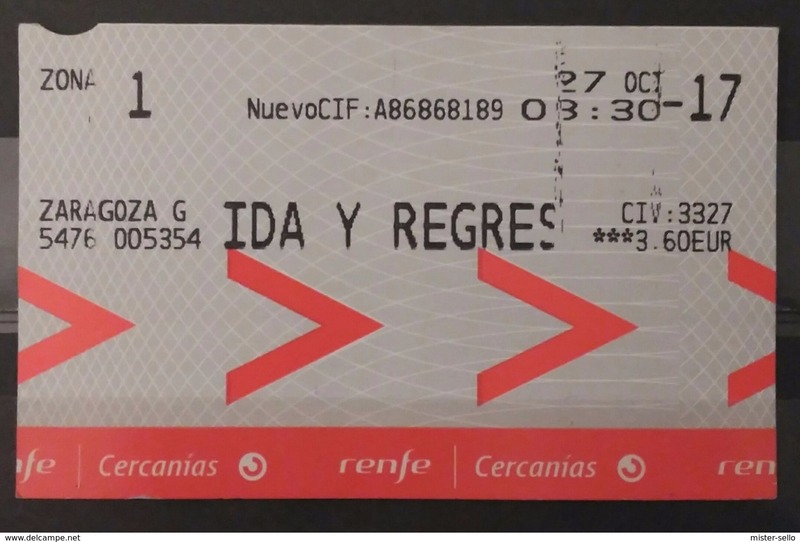 2018 RENFE ESPAÑA. 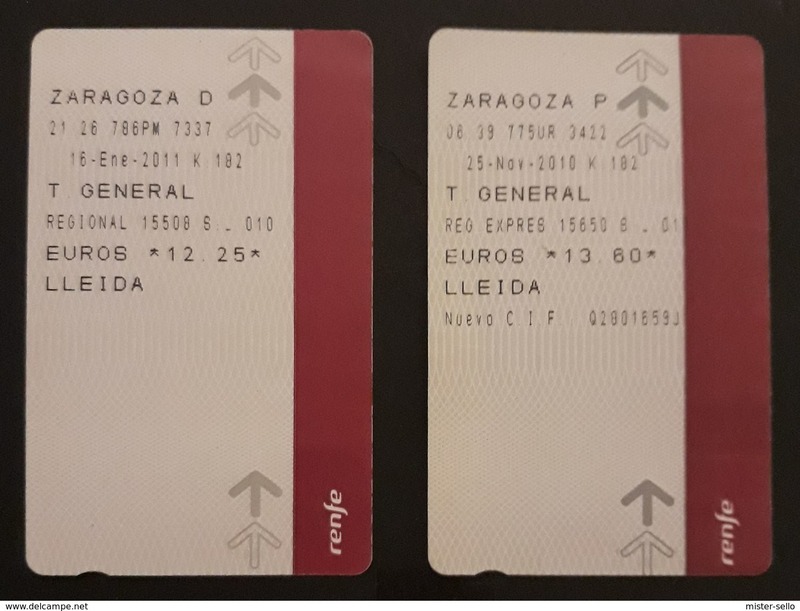 2 TICKET DIFERENTES DE TREN. 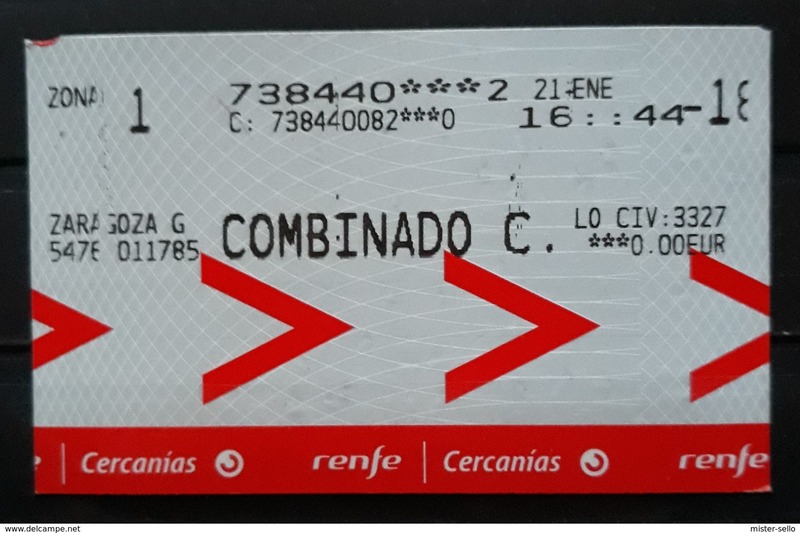 2018 RENFE ESPAÑA. TREN CASTEJON - ZARAGOZA. TICKET. RENFE ESPAÑA. 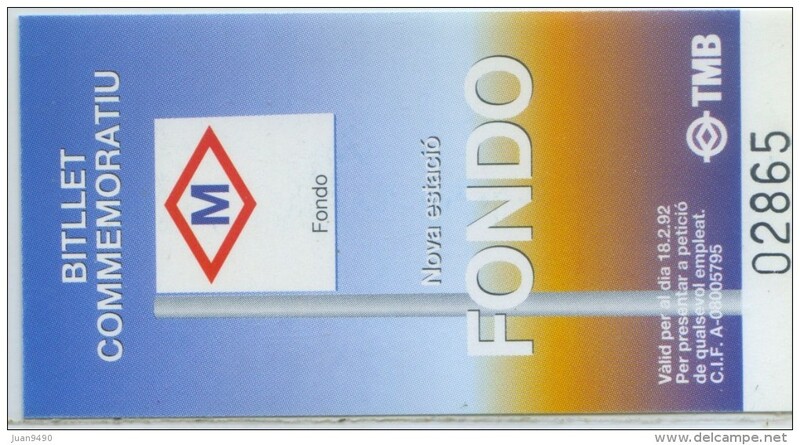 COPIA PARA EL CLIENTE. 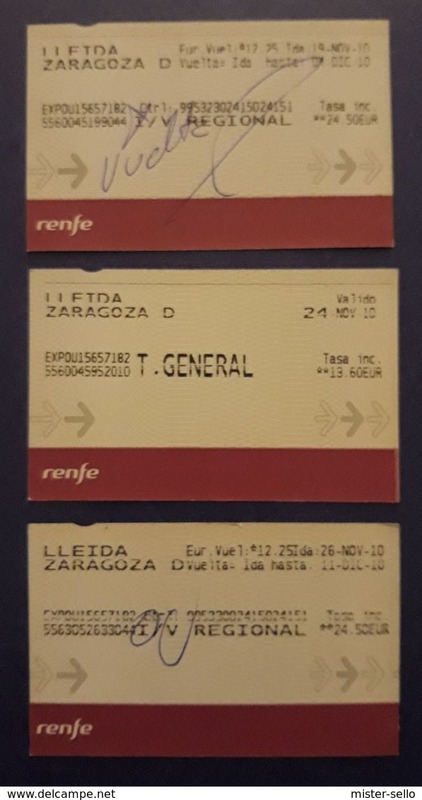 TREN LLEIDA - ZARAGOZA. RENFE ESPAÑA. 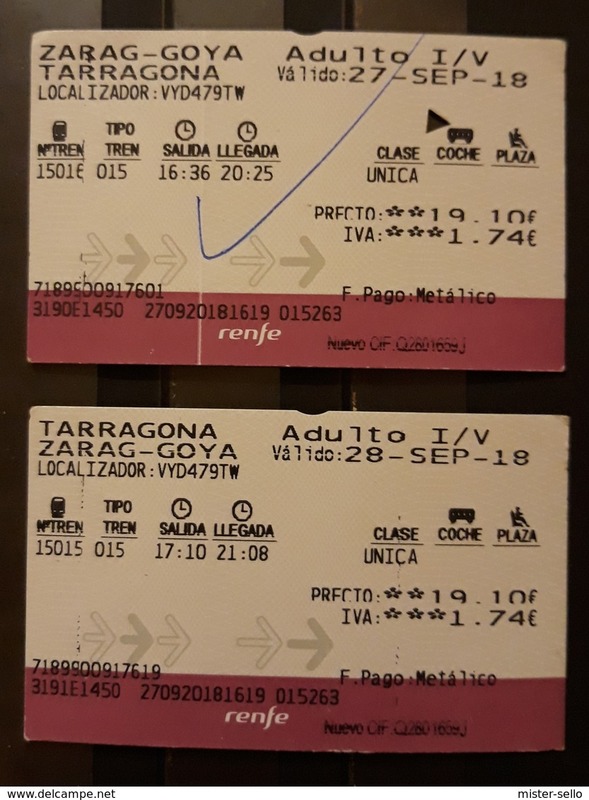 TREN ZARAGOZA - LLEIDA. 3 TICKETS DIFERENTES. RENFE ESPAÑA. 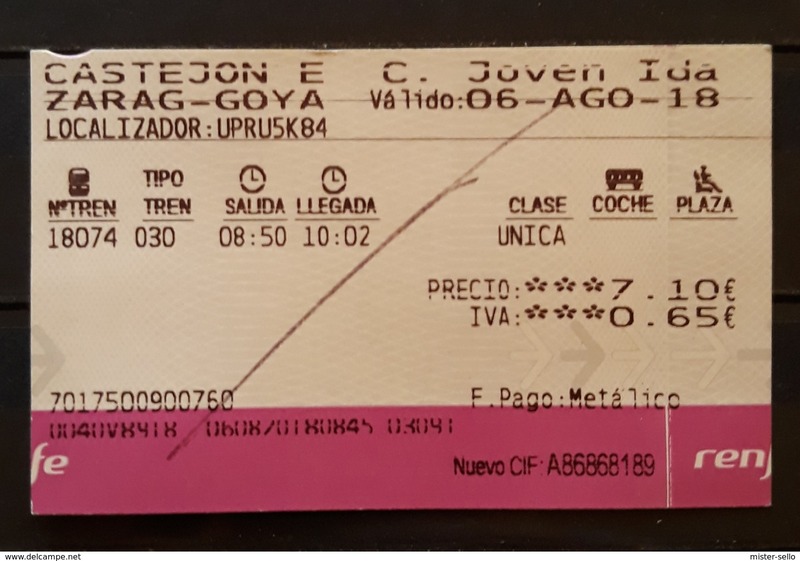 TREN ZARAGOZA - LLEIDA. 2 TICKETS DIFERENTES. 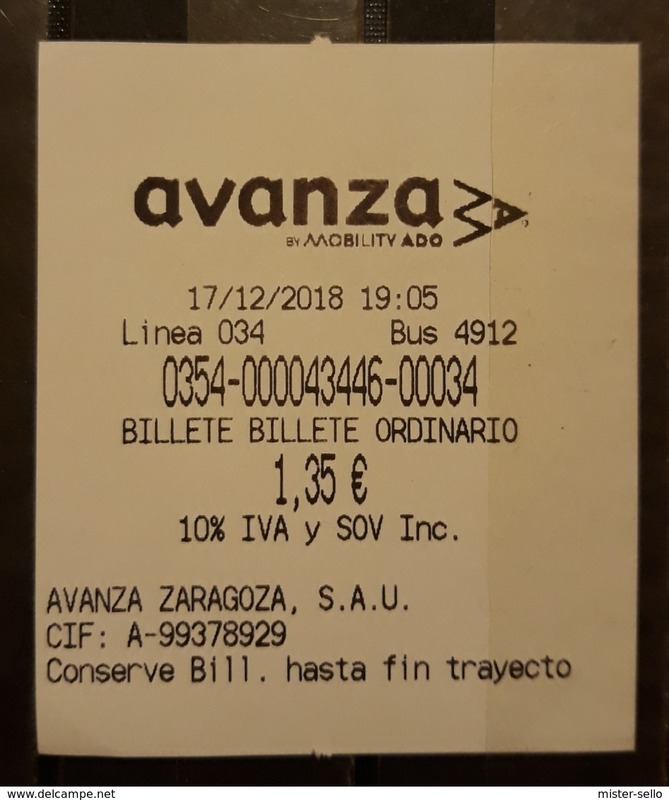 BILLETE ZARAGOZA - VALENCIA. 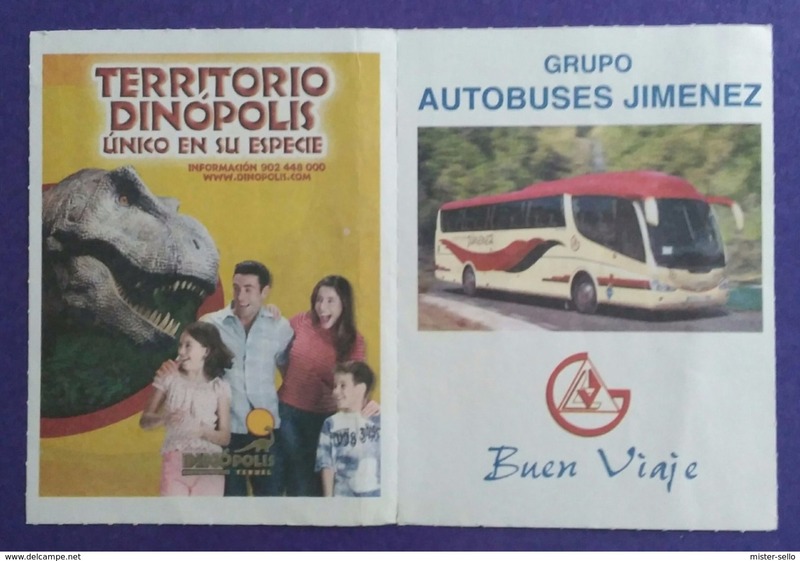 BUS - AUTOBUS - DINÓPOLIS. USADO - USED. 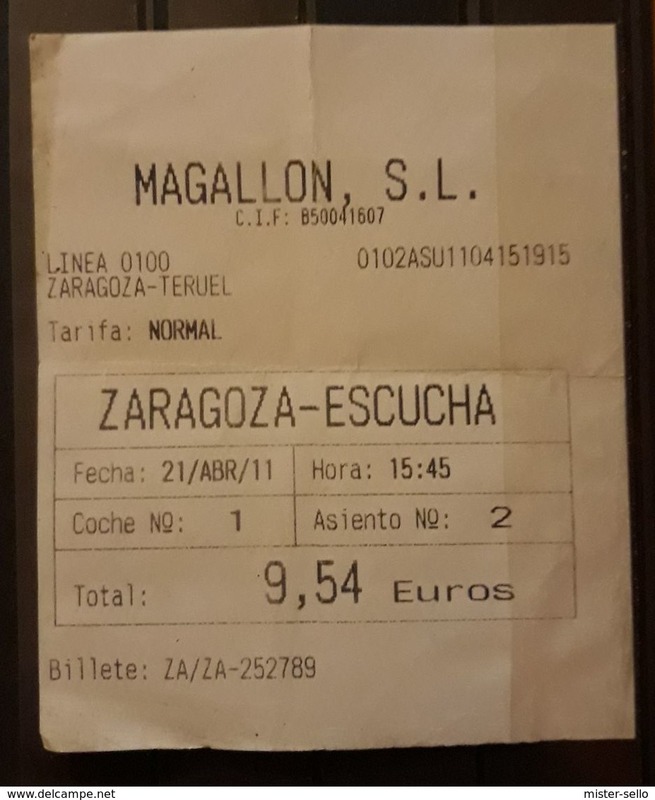 2 BILLETES ZARAGOZA - GUETARIA. BUS - AUTOBUS. USADO - USED. 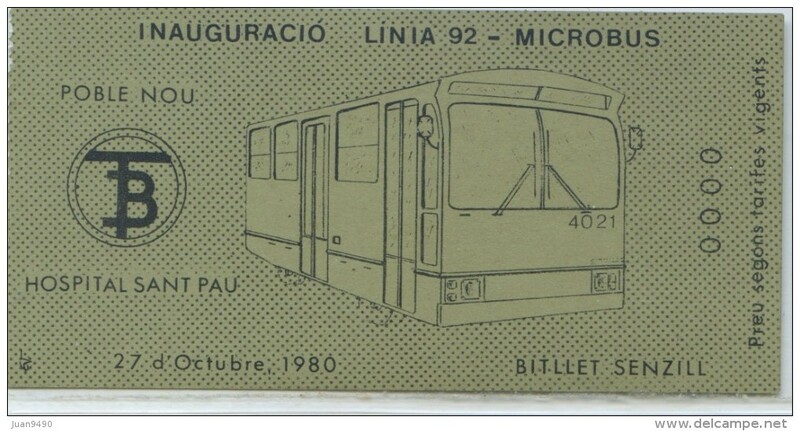 BUS - AUTOBÚS. 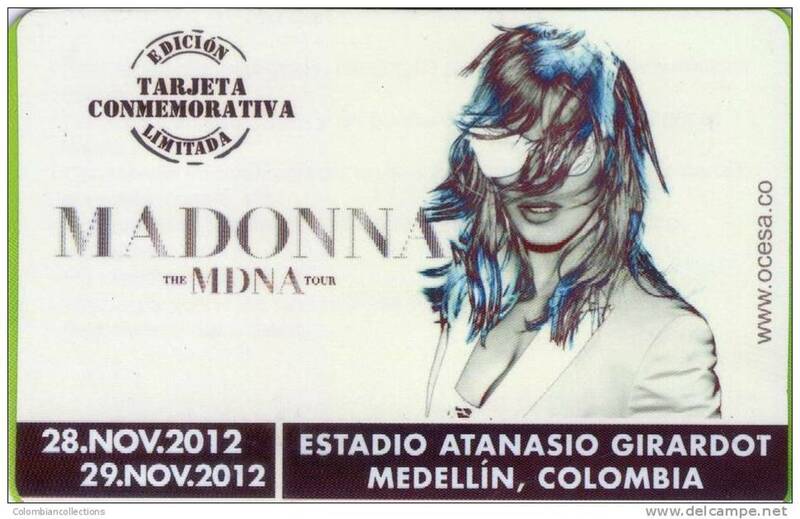 TICKET RECARGA. ZARAGOZA- ESPAÑA. BUS - AUTOBÚS. VIAJE ZARAGOZA - ESCUCHA. RENFE ESPAÑA. ZARAGOZA - VALENCIA. 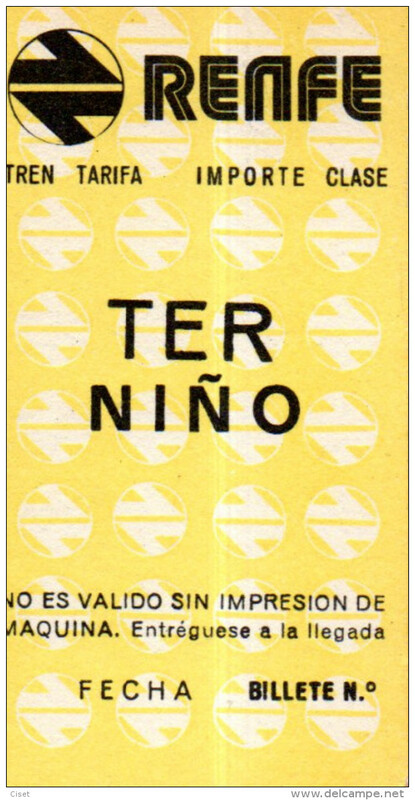 BILLETE DE IDA + BILLETE DE VUELTA NIÑO. 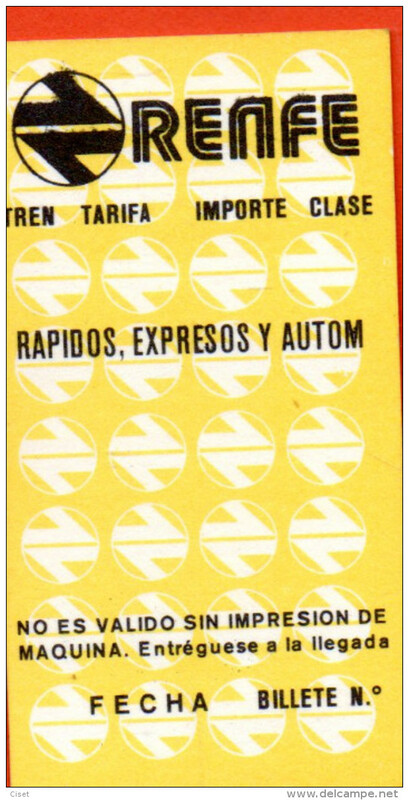 RENFE ESPAÑA. ZARAGOZA -VALENCIA. BILLETE DE IDA + BILLETE DE VUELTA ADULTO. 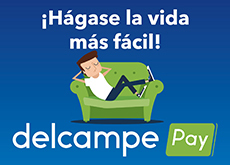 RENFE ESPAÑA. 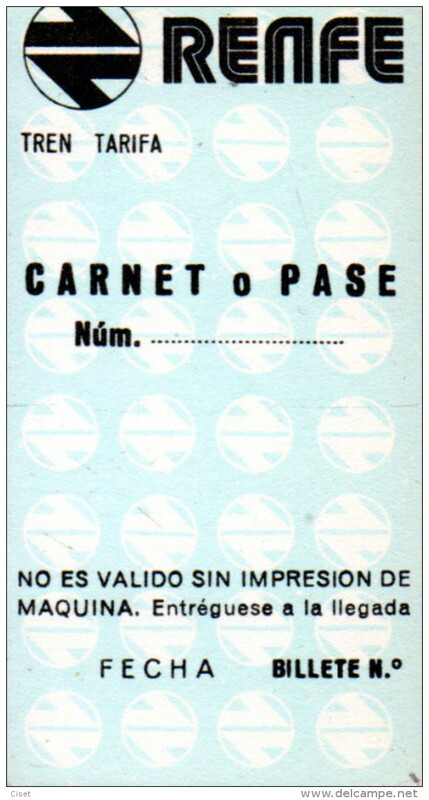 BILLETE DE CERCANÍAS. 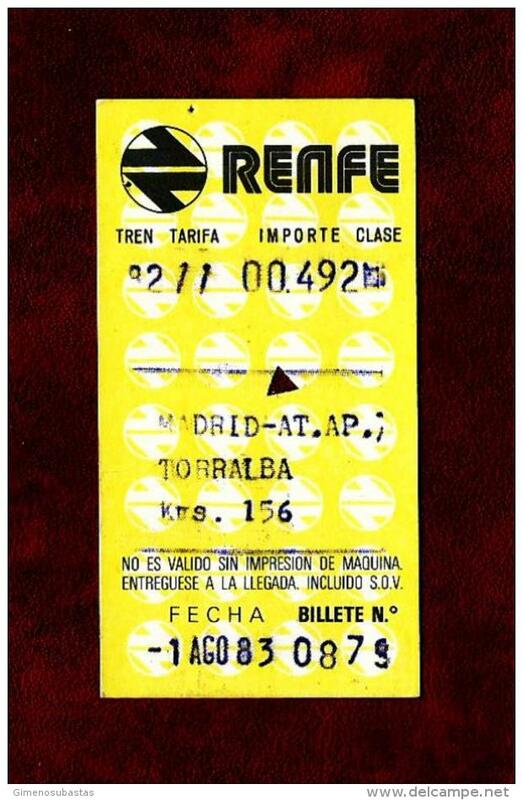 ESPAÑA RENFE - TREN. 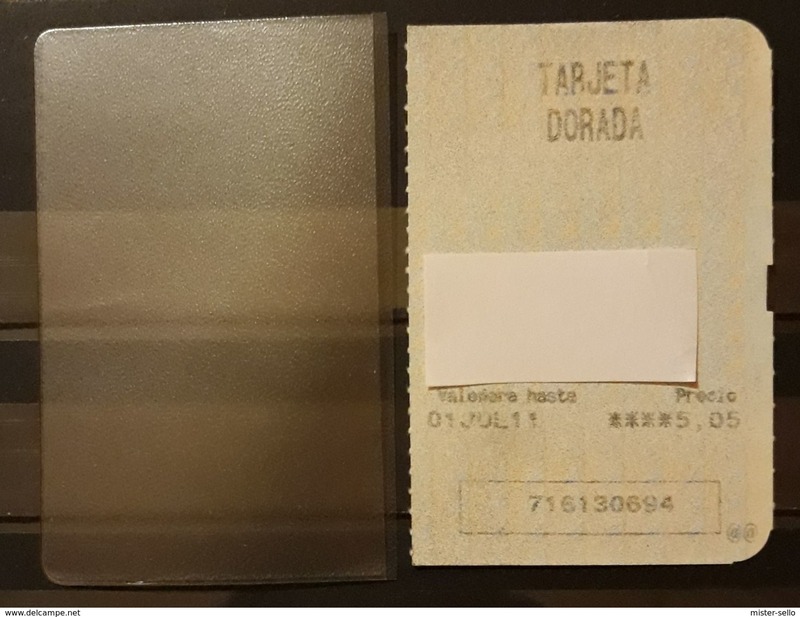 TARJETA DORADA CON SU FUNDA. 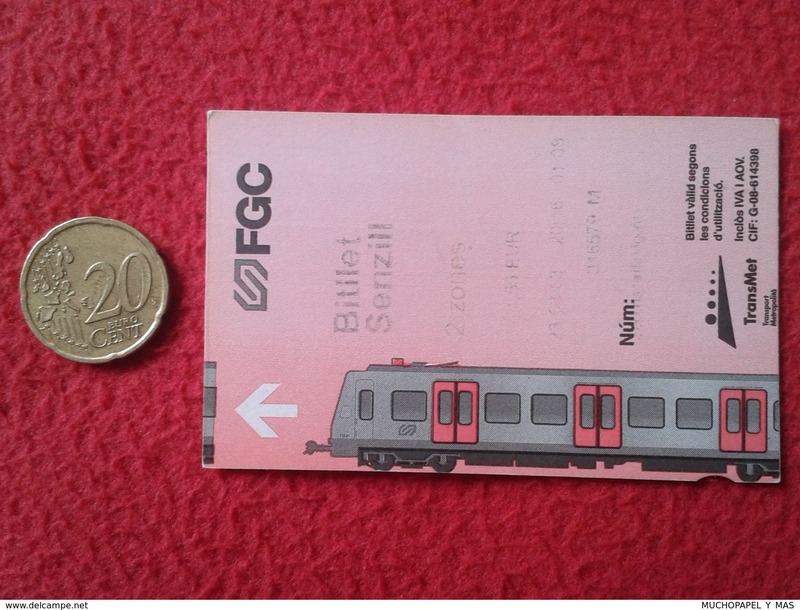 DOBLE BILLETE DE TREN - BREMEN - HAMBURGO. USADO - USED. ESPAÑA. RENFE. 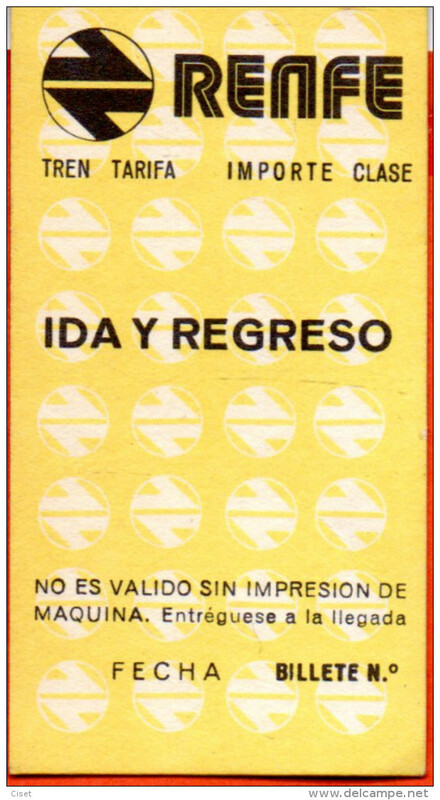 BILLETE DE IDA Y VUELTA. 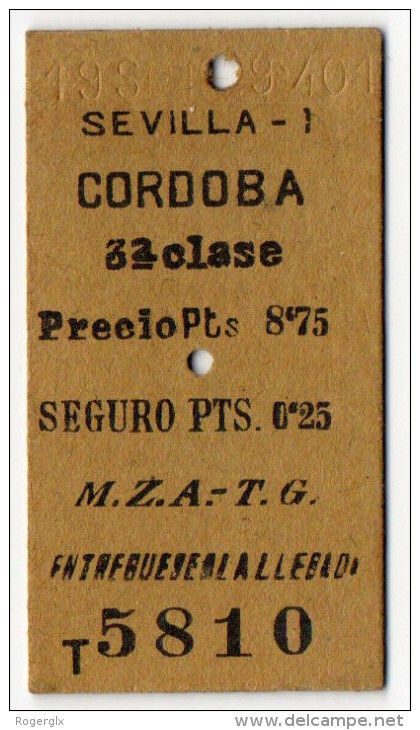 CERCANÍAS ZARAGOZA - UTEBO. 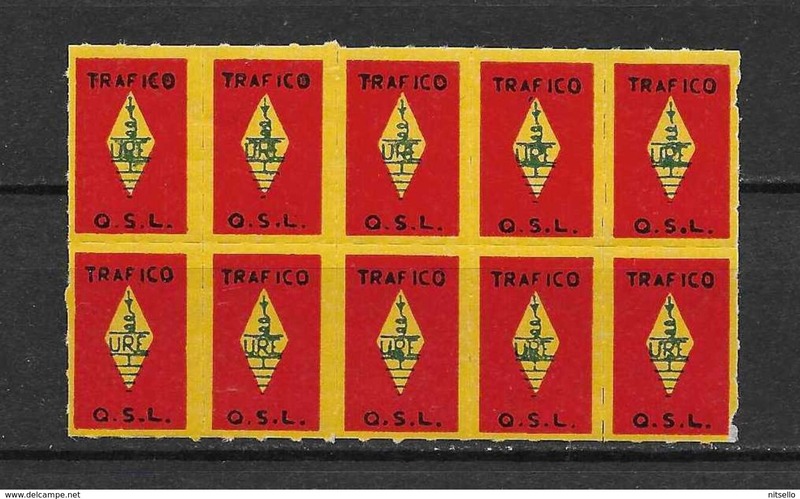 LOTE 1397 /// ESPAÑA CUPONES DE TRAFICO G.S.L. 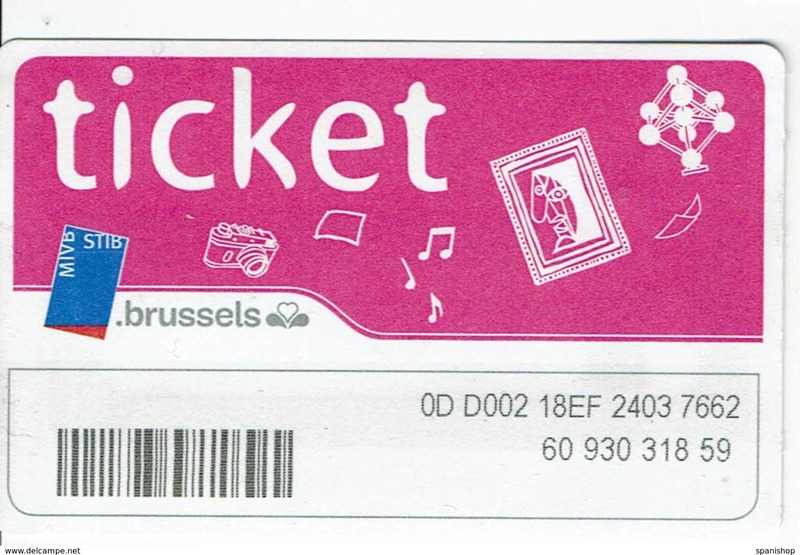 BILLETE DE TREN - LA HAYA - BRUSELAS. USADO - USED. 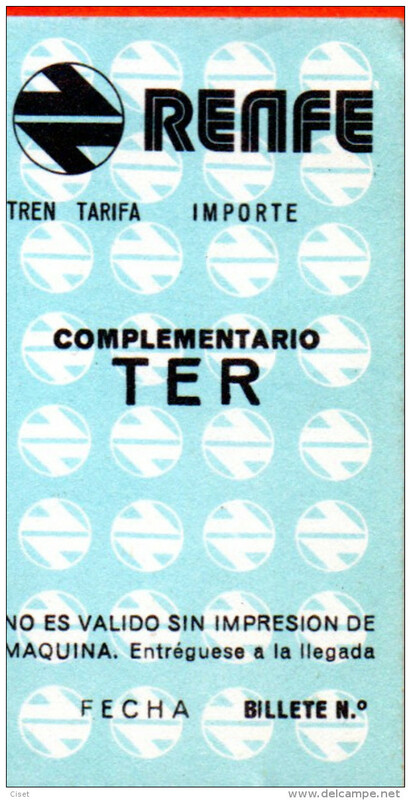 TREN - AVE. BILLETE ZARAGOZA LLEIDA. USADO - USED. BONOBUS DE ZARAGOZA. BUS - AUTOBUS. USADO - USED. BONOBUS DE ZARAGOZA. 1 VIAJE CANCELADO MANUALMENTE. BUS - AUTOBUS. USADO - USED. BONOBUS DE ZARAGOZA. 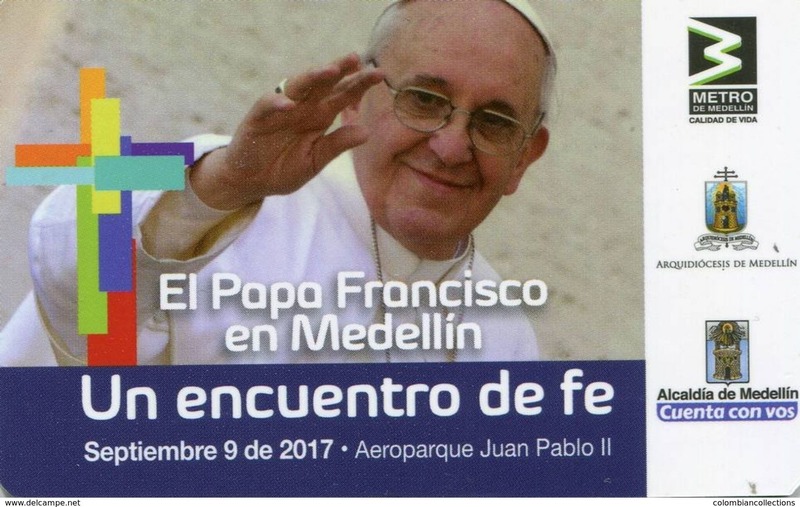 3 VIAJES NO CANCELADOS. BUS - AUTOBUS. USADO - USED. BONOBUS DE ZARAGOZA. 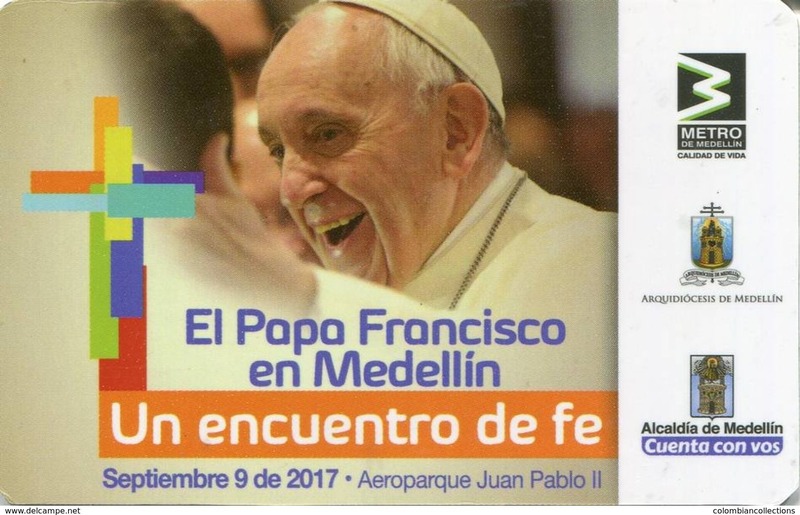 1 VIAJE NO CANCELADO. BUS - AUTOBUS. USADO - USED. ESPAÑA. 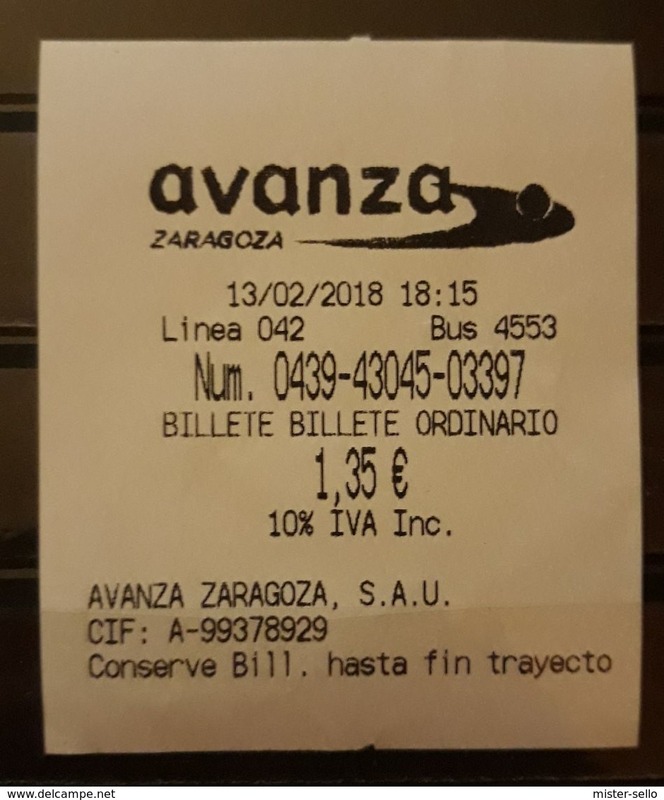 BUS - ZARAGOZA - TUZSA. BONOBUS USADO CON CANCELACION MANUAL. 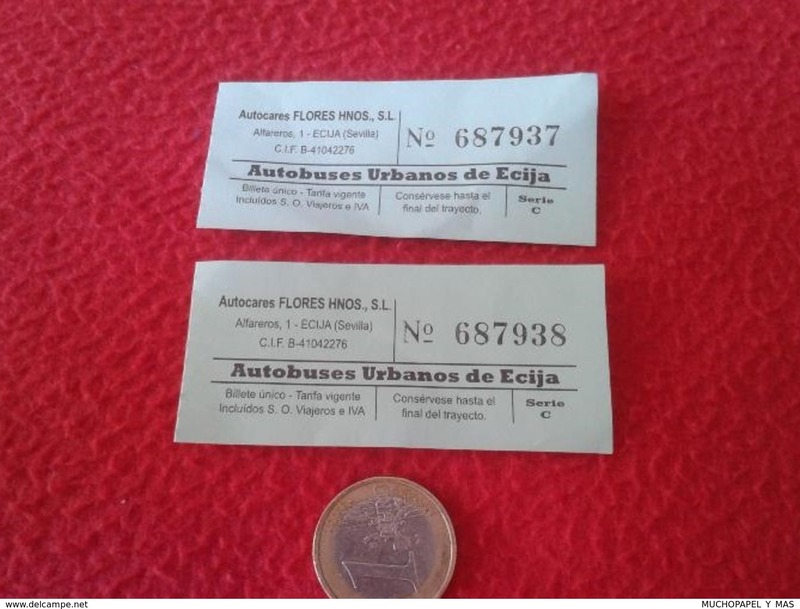 LOTE DE 5 BONOBUSES DE ZARAGOZA. BUS - AUTOBUS. USADOS - USED. España. Iberia. Lineas Aéreas Españolas. 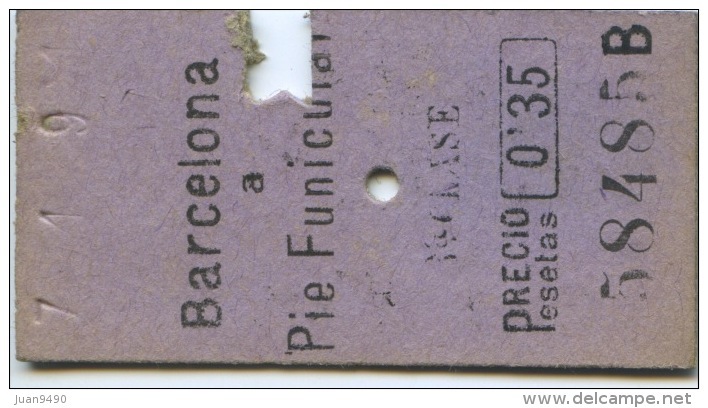 Billete fechado 6-8-1958.